In the last few years, there has been a lot of talk about the competition in the world between brick and mortar shops and online businesses. But the truth is that these two methods don’t have to compete. In fact, they work best when done together! However, there are times when it is hard to see that vision. It’s hard for a retailer to see how they could compete with Amazon, or what role social media could play for a hotel. While this list won’t be comprehensive, we’ve compiled the 4 most common ways that a solid online presence can help a local business. While applicable to most businesses, this is especially important for hotels, restaurants, convenience stores, and unique/novelty shops. To make this relatable, let’s look at an example that most of us have probably lived. Let’s say you’re on a road trip and you are driving through Cheyenne. It’s around dinnertime, so you want to see what restaurants are around. What many people would do in this situation is take out their phone and search “restaurants near me” or “restaurants in Cheyenne”. You would see a result that looked something like this. The majority of people will visit those top three map locations with pictures, referred to as “The Map Pack”. The businesses in the top 3 get triple the amount of visitors compared to listings under “More Places”. Since this is where most visitors in a rush go, tourists and people passing through town go to them most, which means a lot of business for those top 3 locations. This principle definitely applies to all businesses, whether it be an attorney, a retail store, or a plumber. Before the age of the internet, a businesses reputation was primarily spread through word of mouth. While that is still a major factor today, the internet has provided a much wider range of tools to get your opinions heard by a lot of people. Often, this is viewed as a negative by business owners. One angry customer can put reviews on 5 different sites and suddenly that is what most people are reading before visiting your location. But there is a positive side of that. Before, when a customer was angry, there wasn’t much you could do about it. You would likely never know, and would instead just lose the business of them and whoever they talk to. Now, however, you can respond to upset customers. Most review platforms (Google, Yelp) give businesses a platform in which they can send a public and direct response to the upset customer either addressing the issue, offering an incentive as an apology, or some other way to try to make things right. Often when other readers see that you care enough to comment about it, they will have a more favorable opinion. In best cases the original writer changes their review and you get your customer back! While that is great in and of itself, there is a second reason reputation management is helpful, and it relates to our first point on this list. Those 3 listings on the map up there get a lot of visitors, but the ones that get the most visitors are the ones with the highest stars and the most reviews. So basically, it compounds. 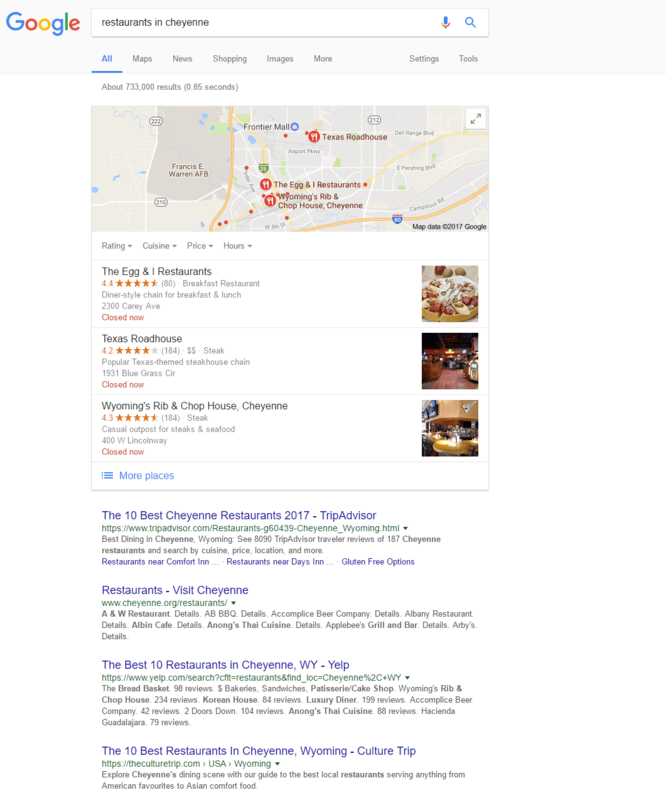 Good reputation management makes happier customers, and it makes good Local SEO even stronger! This is the “duh” point that most people think about right away, and it mostly applies to businesses with products. If you make an E-Commerce website (here meaning one that has products and can process payments), you increase your reach to the entire world! You may be thinking “Amazon has the corner on online shopping. Why even bother trying to compete with giants like that!?”. This is a common concern, but it isn’t necessarily a valid one. Most small shops offer goods that you can’t find on Amazon or anywhere else. People are caring less and less about just the lowest price, and a lot more about quality and experiences. Many of the unique goods that small retail locations offer resonate well with online audiences, and can provide significant income to local businesses. I can’t think of a bigger benefit to small business than this principle, and there is no way I can do it complete justice in this short of a space. Instead I’ll just try to get the concept across and address it in depth later. A coffee shop creates a website and/or app that allows their customers to place and pay for orders from their phone, and then pick them up from the shop. Then if your customer is in a hurry, they can quickly grab and go. Extend this customization by allowing them to save their favorite orders as “usuals” that they can order in one click. You can see from your website data that a user from Facebook browsed one item in your online store for several minutes. You can then send them a targeted ad for that item, perhaps with a small discount or other incentive to buy. Maybe a restaurant or hotel in tourist heavy areas (like Jackson, WY) notices they get a lot of traffic from Chinese or European tourists, so they translate their website, menus, or other marketing materials into those languages to provide easier access to a wider range of customers. Again, these are just a few examples. If you can think of it, it is possible. That is the beauty of the digital age. Not only that, these tools are now accessible to everyone. Just because you live in a small town doesn’t mean you can’t compete. Now some of you might be thinking “Yeah that would all be great, but making all that happen costs a fortune!”, and you would again be justified in your concern. However, there are affordable options! And if you are guessing that we here at Atmosphere Marketing are one of those options, you’d be right! You can get some of these things started for about as much as newspaper advertisements, and get the same amount of results or better! If you’d be interested in seeing some of these benefits in your business, get in touch with us about setting up a consultation. If you don’t need them, but you know someone who could benefit, please share with your friends!